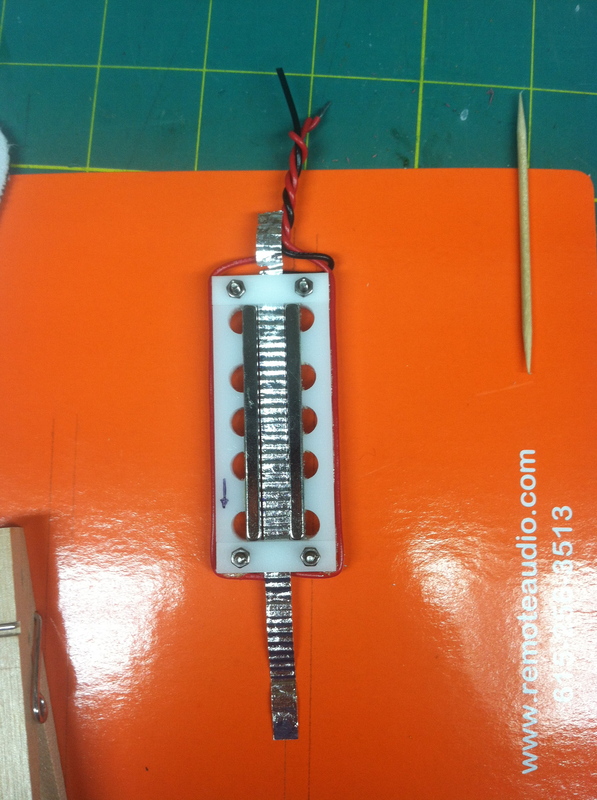 The completed Austin ribbon mic. This one will be given away at the Producer’s and Engineer’s Summit at Welcome To 1979 in Nashville, coming up in November. 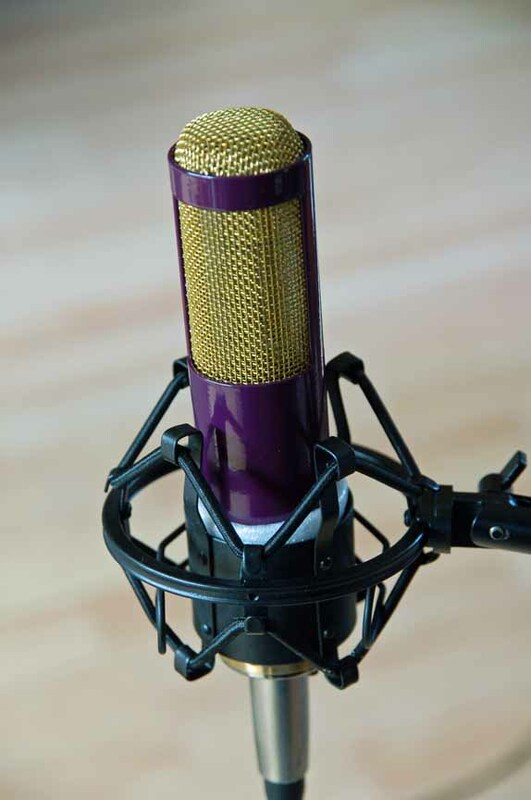 Here’s a look at my Austin ribbon mic, I completed it yesterday. Building this mic certainly was actually really easy, except for one part… installing the ribbon in the frame. I had to do this several times… six, to be exact. I had various problems. One, for example, didn’t show it’s ugly head until I’d completed an installation… tiny tears all along the edge of the ribbon. I learned they were caused by the ruler I was using, which had a cork backing that was set slightly behind the ruler’s edge. This small unsupported space allowed the foil room to stress and tear. I corrected this by using a length of rectangular aluminum as a straightedge, this pressed down on the foil right at the cutting edge. Another problem I had was corrugating the ribbon. I was trying to protect the ribbon by corrugating it with the release paper on the top and bottom, but doing so a) causes the ribbon to curl up, and b) makes the corrugations shallower. If the ribbon isn’t sufficiently corrugated, it is extremely difficult to get it tensioned properly. The tension is important… the ribbon can neither sag in the frame, nor should it be too tight. I had the latter problem, and the ribbon developed a longitudinal curl, so scratch that ribbon. But thanks in no small part to Rick’s patient support via several emails, I finally got one in. It wasn’t perfect… it could be centered just a hair better… but it looked ok, so I closed it up and finished the mic. And considering everything, it sounds quite lovely. The last time I used a ribbon mic was 25 years ago, when I did my thesis recording using a pair of RCA TK77’s that the university owned, so I don’t have much of a frame of reference, but it seems to have a nicely balanced frequency response. From what I understand, construction errors show up as poor highs or lows. I don’t have a frequency analyzer set up yet so I can’t give any numbers, but my subjective analysis says “nice.” Now, like all ribbons, the output is rather low, and I did my testing using a rather crappy mic preamp. On voice, one has to crank the gain up quite a bit, and this gave me a lot of preamp noise. For someone who is a low talker, this wouldn’t work. But I got a rather useable level on my acoustic guitar. Again, I can recommend Rick’s kit quite highly, especially if you’ve never built a mic before. He’s done everything that can be done to insure a good outcome, and the one I built certainly worked out well. That’s not to say it’s simple… you need patience, and good, steady hands will help as well. But I’ve already got parts here to build four more for myself!